An adventure set in the Land of 1,000 Cities. The Feast of Sugri the Bold, an exuberant festival enjoyed by the monkey-people of the Land of 1,000 Cities, is a mere three weeks away. Celebrants for miles around will join the kananaukas of Kishkindha in celebrating the ancient triumph of the warrior maiden Sugri over their ogre slavemasters. The main attraction of the annual feast is the exotic and intoxicating beverage called Lotus Heron, brewed from a secret recipe of mangoes and spices by innkeeper Mathur and his family. Every year Mathur steps up production of his famous brew and hires extra workers to harvest the spices that give the drink its distinctive flavor. This year, however, all is not well in Kishkindha. Rumors are circulating in the city that the spice groves are cursed. More and more workers refuse to return. Some claim to have seen a bloodthirsty beast stalking, slithering or sneaking through the jungle. Some even say they've become ill because of the curse. As the level of hysteria mounts, the production of Lotus Heron has fallen off dramatically. If harvesting of the spices doesn't resume soon, there won't be enough of the beverage for the feast. Mathur's reputation will suffer, but even worse, his family's livelihood is at stake. And now his oldest son, who's been supervising the workers in the groves, has been attacked and seriously injured by what the kananaukas are calling the “Spirit Beast.” Mathur is at his wits' end. Is there no one who can find out what's happening in the spice groves in time to save the feast–and Mathur's business–from disaster? 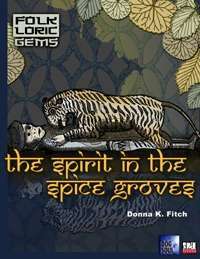 The Spirit In the Spice Groves is set in Sahasra, a setting for d20 fantasy inspired by the legends of India. It is intended for 4th level PCs.